VID The last Concorde to take to the skies, G-BOAF (216), has come to a stop for the final time in the soon-to-open Aerospace Bristol museum. The supersonic passenger plane first flew on 20 April 1979 and touched down for the last time on 26 November 2003. The plane was the last Concorde to roll off the production line and the last to make a flight. That final journey was from London Heathrow to Bristol's Filton airport, where the plane has remained ever since. 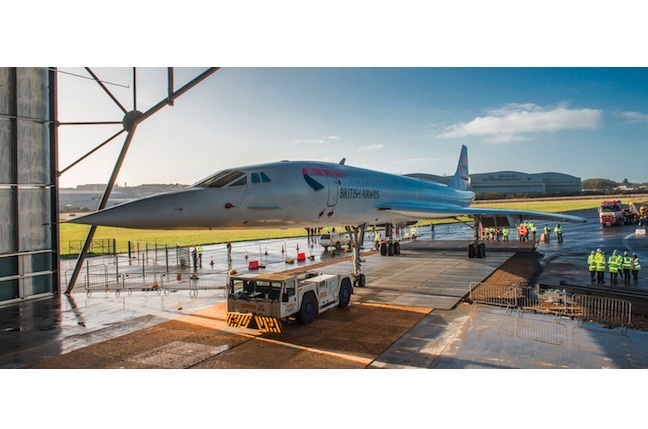 The museum now says it recently completed a hangar that will house its Concorde exhibit, so was able to winch the plane into position. Pictures of the move (see top of story or here for m.reg readers) show the plane being towed by what The Register strongly suspects is an aircraft tug, a class of vehicle a spot of searching reveals has a top speed of 25km/h. With Mach 1 often measured at 1234 km/h, if the tug hit top speed Concorde's last journey was made at Mach 0.02, and about 1.5 per cent of the plane's top speed of 2,179 km/h. It's more likely the plane's final roll was slower still as the museum says it was “slowly and carefully winched” into the hangar with extreme care as there was “less than a metre between each wing tip and the building”.